I’ve been making a few book covers recently – I started with a couple of favourite pieces of fabric, then a few more, and then a few more. 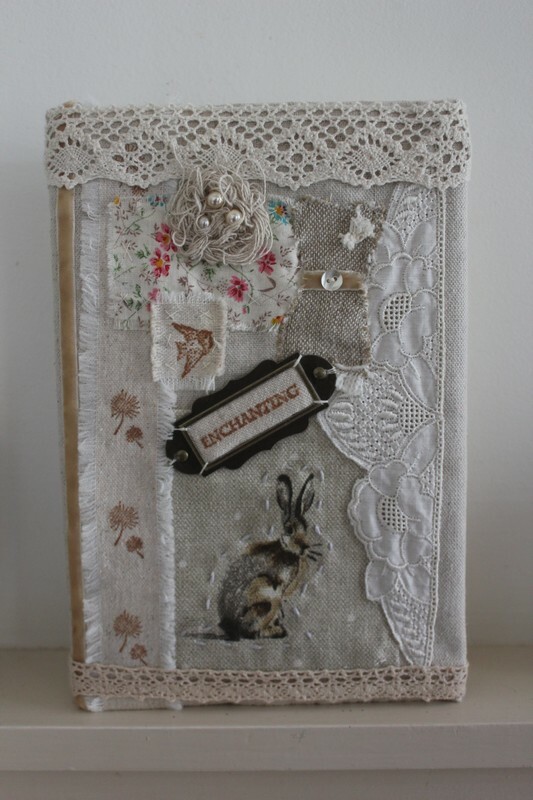 It has been lovely rummaging around and using old pieces of lace and buttons I have been hoarding for some time now. I have a small stash of half-made covers waiting for that last button. The photo is of a diary cover I made for myself. 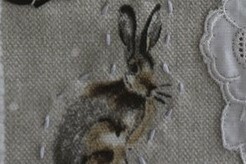 I made some cushions for my sister and my sister in law recently using this adorable hare fabric. When I went to buy the second lot I made sure I bought enough to make something for my cottage as I really fell for it. Although the fabric is brand new it is linen and great to work with – my sewing machine loved it. ← Previous Post: Vintage Tea Cups – which are your favourites?